ROME, Jun 23 (IPS) - Record high temperatures are gripping much of the globe and more hot weather are to come and. This implies more drought, more food insecurity, more famine and more massive human displacements. In fact, extremely high May and June temperatures have broken records in parts of Europe, the Middle East, North Africa and the United States, the World Meteorological Organization (WMO) reported, adding that the heat-waves have arrived unusually early. At the same time, average global surface temperatures over land and sea are the second highest on record for the first five months of 2017, according to analyses by the US National Oceanic and Atmospheric Administration (NOAA), NASA-Goddard Institute for Space Studies and the European Centre for Medium Range Weather Forecasting Copernicus Climate Change Service. In Portugal, extremely high temperatures of around 40 degrees Celsius contributed to the severity of the devastating, fast-moving weekend wildfires that ripped through the country's forested Pedrógão Grande region, some 150 kilometres (95 miles) north-east of Lisbon, leaving dozens dead and more injured. WMO on 20 June also reported that Portugal is not the only European country experiencing the effects of the extreme weather, as neighbouring Spain – which had its warmest spring in over 50 years – and France, have seen record-breaking temperatures. France is expected to continue see afternoon temperatures more than 10 degrees above the average for this time of year. Meantime in Spain, spring (from 1 March to 31 May 2017) has been extremely warm, with an average temperature of 15.4 ° C, which is 1.7 ° C above the average of this term (reference period 1981-2010), the UN specialised body informs. Many other parts of Europe, including the United Kingdom, also witnessed above average temperatures into the low to mid 30°s. On the other side of the Atlantic, the US is also experiencing record or near-record heat, WMO reported. In parts of the desert southwest and into California, temperatures have hovered near a blistering 120 degrees Fahrenheit (49 degrees Celsius). Media reports on 20 June suggested that some plane traffic was halted in and out of Phoenix Sky Harbour International Airport in Arizona because it was too hot to fly. The flight cancellations came amidst of one of the hottest days in the past 30 years of record keeping in the US state. Near record-to-record heat has also been reported in the desert South West US and into California, with highs near 120°F (49°C) in places. More than 29 million Californians were under an excessive heat warning or advisory at the weekend. Phoenix recorded 118°C (47.8°C) on 19 June. A number of flights to Phoenix Sky Harbour International Airport were reportedly cancelled because it was too hot to fly. And the so-called Death Valley National Park, California, issued warnings to visitors to expect high temperatures of 100°F to over 120°F (38°C to over 49°C). Death Valley holds the world record for the highest temperature, 56.7°C recorded in 1913. Meantime, temperature in United Arab Emirates topped 50°C on 17 May, while in the centre of Iran's Kuzestan province in the South-East of the country, neighbouring Iraq, temperatures reached 50°C on 15 June, said the UN specialised agency. The heat-wave in Morocco peaked on 17 May, when there was a new reported record of 42.9°C Larach Station in northern Morocco. Meanwhile, the world has marked New Inhumane Record: One Person Displaced Every Three Second. Nearly 66 million people were forcibly displaced from their homes last year, the United Nations High Commissioner for Refugees (UNHCR) informed in its report Global Trends, released ahead of the World Refugee Day on June 20. The figure equates to "one person displaced every three seconds – less than the time it takes to read this sentence. Such an unprecedented high records of human displacements is not only due to conflicts. In fact, advancing droughts and desertification also lay behind this "tsunami" of displaced persons both out of their own countries and in their own homelands. Monique Barbut, UNCCD Executive Secretary, reminded that the world's drought-prone and water scarce regions are often the main sources of refugees. 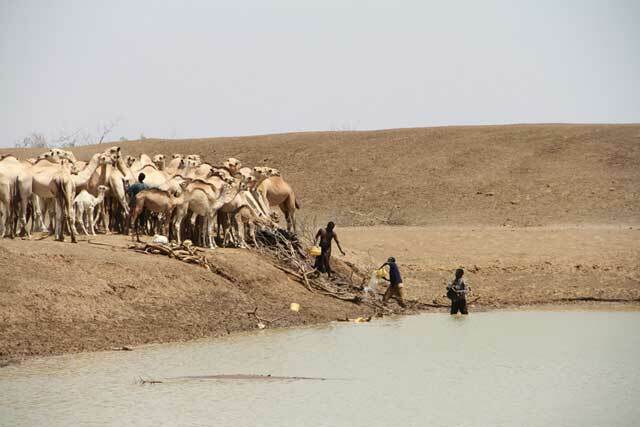 Neither desertification nor drought on its own causes conflict or forced migration, but they can increase the risk of conflict and intensify on-going conflicts, Barbut explained. See: Mideast: Drought to Turn People into Eternal Migrants, Prey to Extremism? In Parallel, the United Nations leading agency in the fields of agriculture has issued numerous warnings on the huge impacts that droughts have on agriculture and food security, with poor rural communities among the most hit victims. As a ways to help mitigate the effects of the on-going heat waves, the UN Food and Agriculture Organization (FAO) on 20 June signed with WMO an agreement to deepen cooperation to respond to climate variability and climate change, "represents an urgent and potentially irreversible threat to human societies, natural ecosystems and food security." Through this joint work, the two organisations will work on strengthening agro-meteorological services and making them more accessible to farmers and fishers; improve global and region-specific monitoring for early warning and response to high-impact events like droughts. The agreement was signed on June 19 by FAO Director-General José Graziano da Silva and WMO Secretary-General Petteri Taalas on the sidelines of an international seminar on drought organised by Iran, the Netherlands, and FAO in Rome. "Saving livelihoods means saving lives - this is what building resilience is all about," said Graziano da Silva. Recalling the 2011 drought in Somalia that saw over 250,000 people perish from hunger, he said, "People die because they are not prepared to face the impacts of the drought - because their livelihoods are not resilient enough." "For years, the focus has been responding to droughts when they happen, rushing to provide emergency assistance and to keep people alive," he said, noting that while "of course, that is important," investing in preparedness and resilience is essential.